It is a matter of days before Croatia’s government collapses. At a press conference that has been expected for days now, First Deputy Prime Minister and leader of the mandate-bearing party – the Croatian Democratic Union (HDZ) – Tomislav Karamarko announced that his party, which was hurt by the scandals in the last few weeks, will ask for a vote of no confidence in the non-partisan Prime Minister Tihomir Orešković in Parliament, where there is already a request in line by the opposition Social Democratic Party (SDP) for a vote of no confidence against Karamarko himself. This move will cost Croatia and the HDZ a few more days at the least, or more likely weeks of uncertainty and instability. And this means that the long expected reforms in the country will fail to start this year as well. The political crisis in Croatia was to a large extent foretold by the November election result when the two largest political opponents – the Social Democrats of Zoran Milanović and Tomislav Karamarko’s Patriots finished with almost equal election results. The HDZ led Patriotic Coalition came out a “relative winner” of the elections, meaning it did not have enough hands in Parliament to form a government of its own. The reason for the levelled election results was the wedging between the two arch-enemies in Croatian politics of the reformist coalition of independent lists Most as an alternative and the clearly stated will of a considerable portion of Croatian voters for breaking away from the status quo and a fundamental change. From the very beginning the negotiations on forming a government were marked by the attempts of the two political mastodons to blend in (and even buy out) Most members in order to clear their path to power and reinstatement of the political balance, which has dominated Croatia since its independence. Most, however, turned out to be tougher than expected and did not give in. They managed to force their will over the Patriots and at their demand the completely unknown to the political scene Tihomir Orešković, who grew up in the Croatian diaspora in Canada, does not speak Croatian well, but has a good track record as a manager in large multinational companies, was installed as Prime Minister. His appointment was the price for the Most's support for a government with the participation of the HDZ. Despite his poor command of the Croatian language, attitudes in Croatia a half a year ago were that if this were a true reformist government, any linguistic deficiencies would be forgiven. Alas, problems began from the very first week of the governing of Most and the HDZ. The first scandal unfolded around the appointment of Mijo Crnoja as Minister of Army Veterans because of him not being registered at the address he lives at and having property there, which he received a subsidised loan for, but spent on something else. Mr Crnoja also managed to ruffle Croatian society’s feathers with his idea of forming a list of traitors from Croatia’s war for independence from former Yugoslavia. The minister was quickly removed, but every consecutive HDZ nomination to this important for the Patriots post created a new scandal. The second largest scandal, which did not however end in a resignation, was that of Culture Minister Zlatko Hasanbegović, who has for months now been causing criticism both inside Croatia and abroad for his attempts at reviving the Ustaša nostalgia and his past as a supporter of the Independent State of Croatia (NDH), which was an ally to the Fascist regime during World War Two. Despite sharp international reactions to his appointment, the HDZ not only did not disown him, but even appointed him to its highest governing bodies after the internal party elections in May. More and more serious scandals followed, linked to the mass dismissals of bosses in the Croatian national television and radio, replacements in the Council for Electronic Media, cutting off the financing of non-profit media and non-governmental organisations, the beheading of key structures. There was a huge scandal and much political pressure around the requested replacement of the head of the intelligence agency SOA. 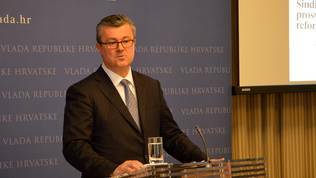 The pressure for personnel policy in other power structures in the country was also great and somewhat successful, benefiting the HDZ. 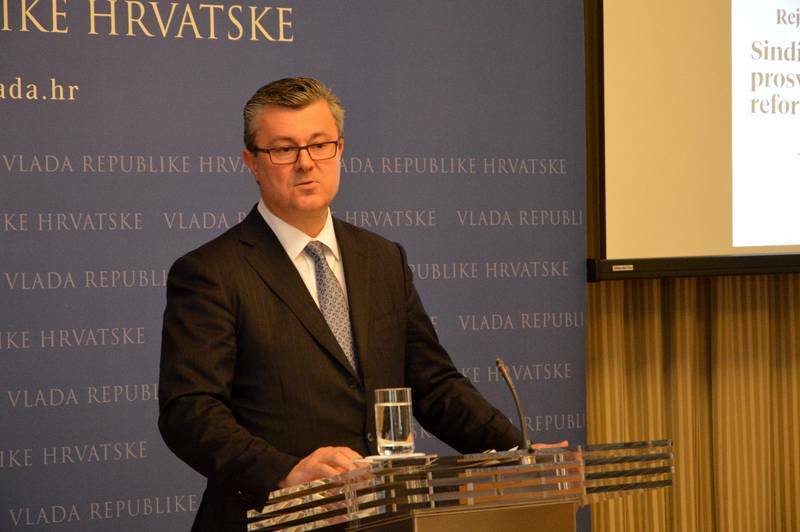 During all this time, Prime Minister Orešković and his Finance Minister Zdravko Marić (HDZ) attempted to float above the scandals and push through the national reforms programme, to no avail. The coalition partners jumped from scandal to scandal. The low tolerance threshold to immoral acts was gradually raised, until it got to the largest scandal in Croatia ever since the days of previous Prime Minister and HDZ leader Ivo Sanader. The current party leader was accused of conflict of interest and even abuse of power after Croatian media revealed that his wife had a PR services contract with a famous lobbyist of the Hungarian oil company Mol, which is in possession of a controlling stake in the Croatian company Ina. Josip Petrović is not only a Mol lobbyist, but a personal friend of Mr Karamarko. This PR services contract of Mrs Karamarko, still Šarić at the time, made her career in the PR business. Her name turned out to be linked to other dubious deals and mentioned alongside the names of Russian investors, backed by the Kremlin. By all accounts Karamarko was not supposed to survive this scandal, but he is still standing, although at the price of division within his party. No, Tomislav Karamarko will not resign from the posts he occupies. Instead, he officially announced the dissolution of the brief, under six-months-long political marriage between the HDZ and the reformists of Most of independent lists. The HDZ is going to move for a vote of no confidence in Parliament, which will probably receive support by the Social Democrats, whose leader Zoran Milanović also wants the collapse of the government and snap elections in July. To the list of scandals we need to add the one surrounding the educational reform, which managed to drive over 50 thousand people out in the streets of a number of Croatian cities. This protest was the clearest sign that Croatian society does not want what the HDZ is offering, namely a conservative revolution following Poland’s example. According to Croatian media and analysts, this is the severest political crisis in the country since the war. At its base sits the HDZ, which under the “New time, new power” slogan demonstrated they had not undergone a catharsis after the “Sanader” case and the numerous other scandals in his government, the resolution of which led to the successful accession of Croatia to the EU on July 1st 2013. The party and its leader claim, however, that Most are responsible for the crisis, because they are politically inexperienced and acted more as opposition to the government, instead of as a coalition partner. Most in turn claim that the HDZ are an obstacle to their reforms and are too preoccupied with personnel issues, rather than with reforms. The lack of harmony in the political marriage between Most and the HDZ also brought about a parliamentary crisis, where quorum could not be achieved for three weeks, so that important bills get passed. Among the absent MPs were quite a few from the Patriotic Coalition and the HDZ in particular, which forced the leader Karamarko, whose appearance in the previous parliament was so rare that it made the news, threaten his MPs there will be penalties for not showing up in plenary. The problems between the coalition members escalated so much that PM Orešković was forced to ask for the resignations of his two deputies – the leaders of Most (Božo Petrov) and the HDZ (Tomislav Karamarko). Over the last couple of days the ball was passed entirely in the field of the HDZ, where there was an emergency meeting of the party’s governing bodies last week and according to Croatian media, heavy words were exchanged. Tomislav Karamarko’s right hand man Miljan Brkić urged him to step down from government in the name of the party’s remaining in power, but he refused. Now Brkić, too, will fall out of political favour, similar to several other prominent HDZ-ists like MEPs Andrej Plenković, who had ambitions to run for the position of HDZ leader this spring but was not encouraged to, and Davor Ivo Stier, who in a detailed essay last year asked for a serious change in ranks and party policy. The feeling, coming from the news over the last few days, was that all of Croatia is a hostage to Tomislav Karamarko’s survival as leader of the HDZ, re-elected only recently with no competition, and as First Deputy PM. 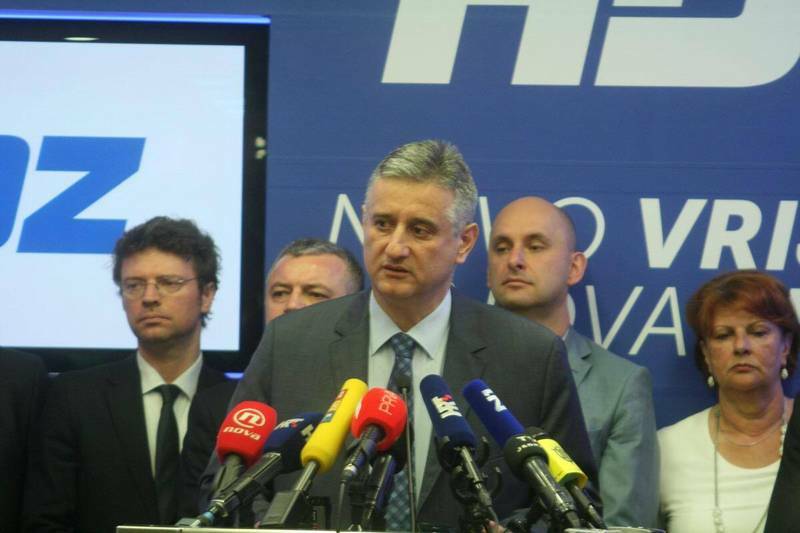 Karamarko claims to have the voters’ support behind him, because the HDZ won the parliamentary elections and is the largest political group in Parliament. This was the case, however, before the huge scandals, some of which incompatible with Croatia’s image of a state, which has successfully accomplished the transition to an European liberal democracy and detached from the Balkan speciality of mixing political and private relations. Furthermore, Karamarko built his defence on the presumption that the HDZ under his leadership came out victorious in the last several elections in the country. He is, however, misled by these victories. During the two votes for European Parliament the HDZ managed to beat the Social Democratic–Liberal Kukuriku coalition (later “Croatia is Growing”) due to preferential voting, when voters preferred the conservative Ruža Tomašić, who was leader of the Croatian Party of Rights Dr Ante Starčević and is not a HDZ-ian. Preferential voting got another member of the Croatian diaspora abroad elected – Davor Ivo Stier (born and raised in Argentina), despite his falling into disgrace in the party and was at the bottom of the party ticket. He represents the moderate, reformist wing of the HDZ, same as his influential EP colleague, Andrej Plenković, Chair of the Delegation to the EU-Ukraine Parliamentary Association Committee and Vice-Chair of the powerful Committee on Foreign Affairs of the EP. Karamarko also boasts of the party’s victory at the presidential elections last year, credit for which is due to Ms Kolinda Grabar-Kitarović. Back then the race was also quite close. HDZ scored a victory as well at the local elections in the country. The parliamentary elections of November 8th 2015, however, clearly demonstrated that when it is about overall support for the party voters are not quite as certain. Tomislav Karamarko continues to be the most disliked politician in Croatia. The latest polls show that the vast majority of Croats want new elections. HDZ support is dropping noticeably and if snap elections are held any time soon, the relative winner will be the SDP, but the result will again be undecided, for expectations are that the Social Democrats will not be able to form an independent government. Most are the big looser from their six-month marriage with the HDZ. Benefiting most from their downfall is the SYRIZA-like party Live Wall, which is strongly eurosceptic and wants Croatia to leave NATO. In fact, the biggest loser from the current political crisis is the country, which lost investors’ trust last week and thus the issuing of Eurobonds to the market was postponed. At the same time, economy data surprised with considerably faster GDP growth than expected – 2.7% in the first quarter. Even such good news, however, sank in the heavy political crisis, the resolution of which is further postponed in expectation of the vote of no confidence. Meanwhile, the decision of the commission for establishing conflict of interest is expected in the case of Tomislav Karamarko and his wife. 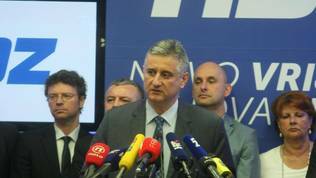 At his press conference on Tuesday, the HDZ leader stated that the affair, known as “The consultant”, was fabricated in order to harm him. Whether Karamarko will remain standing and at what price will become clear in the next few weeks, when key events are due at the European scene – Great Britain’s referendum for EU membership, the future of the EU after it, solving the current refugee problems, and the deal with Turkey. Croatia has no position on all these issues and such a position is practically not being worked on because of waiting for the resolution of the political crisis. The only good news at the European level is that Croatia expressed readiness to lift its veto on opening Chapter 23 in the negotiations with Serbia if certain conditions are met. If the drama does not end soon, Croatia might not even notice if the Union has become a member short, nor what will be the consequences for Croatia from this. 1) Hasanbegovic is not reviving pro-Ustasa nostalgia. This is a fictitious statement that cannot be proved and could be liable to legal action. He&apos;s merely attacked communist sympathisers for hiding behind their anti-fascist slogan. 2) Some of the scandals mentioned, such as the replacement of media officials, is undoing the acts of the previous leftist government. When they came to power they replaced 40 officials, whereas now only a small number were removed. 3) The current crisis is threatening the issuing of Eurobonds, as mentioned. However, what is not mentioned is that these investments would never have even eventuated had the previous government not been ousted and a technocrat PM installed instead. A few others things, but generally a half-accurate article.